Daily Shine Rosemary Shampoo 500mL is rated 5.0 out of 5 by 9. Rated 5 out of 5 by Rachel474 from Answer to my prayers After having a bad reaction to another brand of shampoo, conditioner and hair care products i was using i decided to look for something more natural that would not irritate my scalp but would still clean my hair really well without being harsh, alchemy was the hair care i switched to and is now my regular hair care routine.The rosemary shampoo comes in a dark green bottle that is beautiful and practical, the smell is beyond amazing! it smells divine and exactly like fresh rosemary. The smell lingers in your hair after and your bathroom also smells amazing. Since switching haircare brands and especially using the rosemary shampoo my scalp has returned to normal and i have had no bad reactions. My hair feels really clean after using this shampoo and is not harsh on your hair, my hair feels amazing since using this shampoo.The only thing i can fault in this shampoo is that it takes a little bit more effort in order to leather it up in your hair. 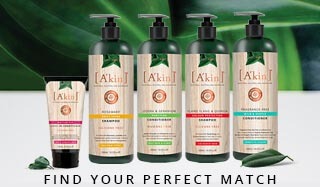 Rated 5 out of 5 by kris from Gently cleanses and smells like a gnome's garden I absolutely love this shampoo from Akin. I have sensitive skin and scalp and this product is so gentle and nourishing for me. I have long, dry (sometimes frizzy) hair and it always leaves it feeling soft and manageable rather than a dry and frizzy mess. Smells delightful just like a gnome's secret garden. I've tried the other Akin varieties but always come back to this one. I would love to see a 1L bottle! Rated 5 out of 5 by Sarah from Gorgeous rosemary scent, gives hair so much shine! 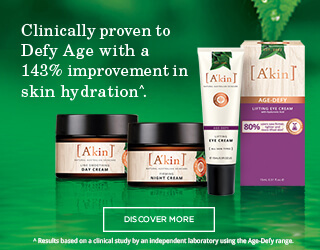 I have been using the Akin Rosemary Shampoo for about 2 months now and it smells so earthy and pleasant that I look forward to showering! Not only does it smell divine, but it gives my hair a boost of shine and 'bounce' each time I use it. I have had so many compliments on my hair since using this shampoo, I absolutely love it. Rated 5 out of 5 by Becha from God sent After radiation and chemo I thought it was normal for my hair to come out in chunks until I tried A’kin Rosemary Shampoo instead of grocery store bought shampoo. Instantly I noticed a difference, no chunks of hair. Where have you been all my life? Rated 5 out of 5 by Beverley from This product is excellent in all regards I have used Al'chemy shampoo for years, however in saying this I would like to see more choice, I used to be able to buy Lavender, in both shampoo and conditioner, I would like to see it made available again. Rated 5 out of 5 by Irene from A delight to use I've used this shampoo for over 10 years. Occasionally I try another brand but find myself longing for the gentleness and uplifting aroma of Atkins wonderful Rosemary shampoo. Rated 5 out of 5 by Emmzzz from Love this shampoo The only thing that would make this better is having it in larger sizes, preferably 1 litre and 2 litre bottles!